Be the first to share your favorite memory, photo or story of Verla. This memorial page is dedicated for family, friends and future generations to celebrate the life of their loved one. 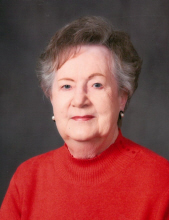 Verla Eudora “Sunny” Ray Crane, age 96, of Blytheville, Arkansas passed from this life on Wednesday, February 6, 2019 at the NEA Baptist Hospital in Jonesboro, Arkansas. Born to Guy H. and Amy Vivian Crouch Ray in Sullivan, Illinois on February 1, 1923, she was owner of Crane Farms, located in Central Illinois and a member of the First Christian Church in Blytheville, Arkansas. Sunny was a resident of Blytheville, Arkansas for the past 58 years. She grew up in Shelbyville, Illinois and married her husband, Jean MacRae Crane on March 11, 1945. Sunny served her country faithfully in the role of an officer’s wife and wife of a Strategic Air Command Pilot and Base Commander in the USAF. Throughout their Air Force career, the Cranes lived in numerous states as well as Europe. She was an active participant in Officer Wives Club activities throughout their time in the Air Force. Following retirement, she volunteered with the Red Cross for more than 20 years and was an active member of the Blytheville AFB Community Council. Sunny was an accomplished seamstress, bridge player and was very active in the First Christian Church. She was owner of Crane Farms in Central Illinois for more than 25 years. A devoted mother, she was very proud of her two daughters and loved spending time with her five grandchildren and five great-grandchildren. Sunny was preceded in death by her husband of 56 years, Retired Colonel Jean MacRae Crane; father, Guy H. Ray; mother, Amy Vivian Crouch Biedert and stepfather, Henry M. Biedert. Sunny is survived by her children: Deitra “DeeDee” Blackwell (Vance) of Little Rock, Arkansas and Cindy Chabolla (Steven) of Round Hill, Virginia; grandchildren: Amy Blackwell Bennett (Trevor), Andrew Blackwell (Meagan), Erin Chabolla Nelson (Jacob), Mary Chabolla (Alfredo Ali-Marina) and Caroline Chabolla; great-grandchildren: Charlotte Bennett, Ava Nelson, Sofia Nelson, Luciana Nelson, and Juliana Ali-Marina. The Family extends their love and undying gratitude to her special caregivers: Juanita Jones, Doris Jackson, Curly Cotton, Cynthia Whitehorn, Sandra Spencer and Nadia Wells. Graveside Services will be held on Saturday, February 16, 2019 at 1:00 pm at Glenwood Cemetery in Shelbyville, Illinois with Reverend Kevin Ray officiating with a private viewing by family and farmers prior to the service. Services in Illinois will be under the direction of Lockart Green Funeral Home, 302 West Main Street, Shelbyville, Illinois. A Memorial Service to honor Sunny’s life will be held on Saturday, March 2, 2019 at 11:00 am in the First Christian Church in Blytheville, Arkansas with Reverends Holly Jo Engle and Keith Hearnsberger officiating. Cobb Funeral Home of Blytheville, Arkansas is in charge of local arrangements. In lieu of flowers, the family requests memorials be made to the Col. J.M. Crane Memorial Scholarship at Arkansas Northeastern College, Attn: Rachel Gifford, Executive Director, ANC Foundation, 2501 S. Division Street, Blytheville, AR 72315; rgifford@smail.anc.edu; 870-838-2902. Condolences may be expressed to the family online at www.lockartgreenfuneralhome.com or www.cobbfuneralhome.com. To send flowers or a remembrance gift to the family of Verla Eudora "Sunny" Crane, please visit our Tribute Store. "Email Address" would like to share the life celebration of Verla Eudora "Sunny" Crane. Click on the "link" to go to share a favorite memory or leave a condolence message for the family.